Netflix has released a new trailer for the upcoming holiday special A Very Murray Christmas, and it's a real treat. Sold as a K-Tel Christmas compilation commercial, we get a sneak peek at all of the musical performances that will be on display in this festive outing from the one and only Bill Murray. And best of all, we get to hear and see George Clooney as he belts out a new sure-to-be Christmas classic. A Very Murray Christmas features all of the season's greatest hits performed by a cavelcade of all-star talent. Bill Murray, Miley Cyrus and a troupe of dancing silver reindeer get down and dirty on 'Sleigh Ride'. Miley Cyrus then goes solo for 'Silent Night', with Paul Shaffer accompanying on piano. Bill Murray and Chris Rock team up for a hilarious rendition of 'Do You Hear What I Hear'. You'll also hear Mya Rudolph. Jason Shwartzman and Rashida Jones tag-team 'Only You'. And then the biggest surprise comes when George Clooney busts out 'Santa Claus Wants some Lovin'. And on December 4, we'll get to see many, many more. 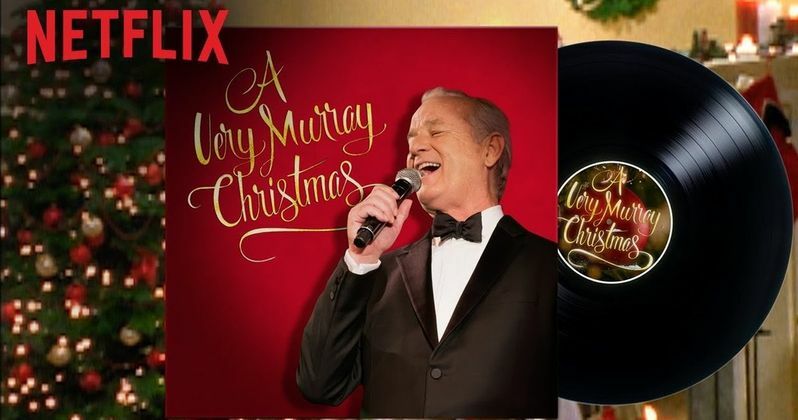 Written by Sofia Coppola, Bill Murray and Mitch Glazer and directed by Sofia Coppola, A Very Murray Christmas is an homage to the classic variety show featuring Bill Murray playing himself. The iconic comedy legend worries that no one will show up to his TV show due to a terrible snow storm in New York City. Through luck and perseverance, guests arrive at the Carlyle hotel to help him; dancing and singing in holiday spirit. The star-studded cast includes George Clooney, Paul Shaffer, Amy Poehler, Julie White, Dimitri Dimitrov, Michael Cera, Chris Rock, David Johansen, Maya Rudolph, Jason Schwartzman, Jenny Lewis, Phoenix, Frederic Moulin, Rashida Jones, Miley Cyrus, and more. A Very Murray Christmas is executive produced by Coppola, Glazer, Roman Coppola and Tony Hernandez. Bill Murray is no stranger to Christmas. In 1988, he starred in the now-classic Scrooged. Though there have been many incarnations of the Charles Dickens' tale, none have ever been told like this. Bill Murray stars as a mean, overbearing programming executive who makes his staff work well into the night on Christmas Eve as they try to pull off an extravagant live production of A Christmas Carol. That same night, Bill Murray's Frank Cross is visited by four ghosts who show him the true meaning of the holidays. Over the past few years, Scrooged has streamed on Netflix throughout the holidays, and will serve as a nice companion piece to A Very Murray Christmas. Scrooged stars David Johansen and Paul Shaffer are even reuniting with Bill Murray for this once in a lifetime Holiday special, which may go down as the greatest Christmas variety show ever attempted in the history of the medium. Take a look as the party gets underway. And if you don't have Netflix yet to enjoy this winter wonderland of fun, there's even a number you can call at the end of this trailer so you don't miss out! A Very Murray Christmas Trailer: Bill Murray Comes to Netflix!